WEST SIDE, Manhattan (WABC) -- Two NYPD officers sustained minor injuries when they were was struck by fleeing cars in separate incidents that occurred around the same time in Manhattan Thursday. The first incident happened on West 55th Street at Eighth Avenue just before noon, when two officers assigned to the Midtown North Precinct were issuing a double parking summons to female driver when she suddenly drove off, striking one of the officers in the left shin. 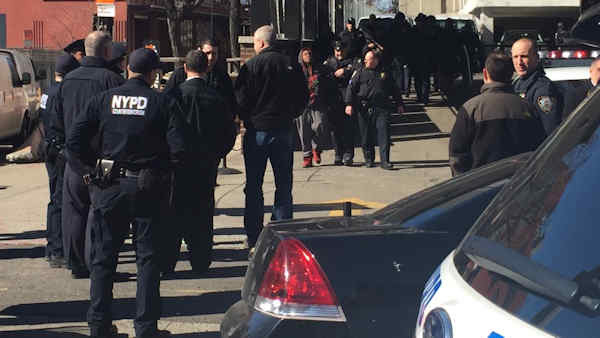 Officers from the Brooklyn North Warrants Squad observed the incident and followed vehicle, pulling over the female driver at West 53rd Street between Ninth and 10th avenues. The driver was taken into custody, as were two other individuals who fled the car but were caught a short time later. The officer who was struck in the shin was taken to New York Presbyterian Hospital with a non life-threatening injury. The second officer was checked out. Meanwhile, about an hour later at 125th Street and Broadway in Harlem, two police officers assigned to Bronx gang unit were conducting car stop when that driver fled, striking at least one of the officers. They gave chase, eventually stopping the vehicle at 34th Street and 12th Avenue on the West Side. Two women and a man were taken into custody. The officer was taken to St. Luke's Hospital in stable condition.